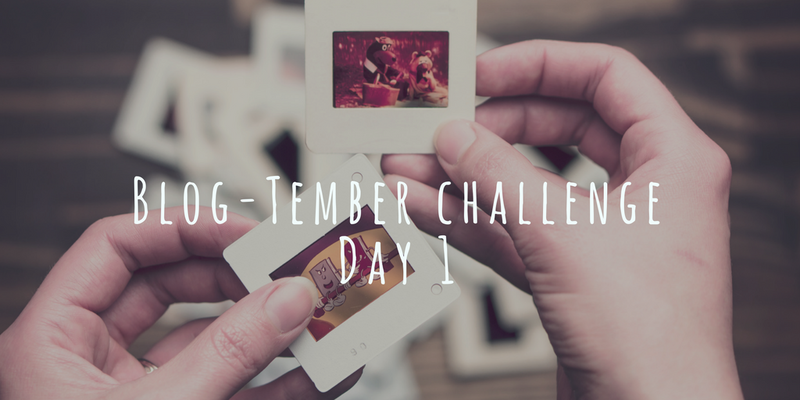 I remember seeing a post this summer about the upcoming Blog-Tember challenge… Fast forward to today and I saw a post about day 3. Oops! I’m behind! So, hey! My name is Laura-Jane but my friends mostly call me LJ. I’m a missionary for Jesus Christ cleverly disguised as a wife, mother, teacher and network marketing professional who loves books, coffee, tacos and wine! In all honesty, that sums me up pretty well. My husband and I have been married for almost 11 years. We met online when it was still taboo. He is retired military which means our relationship has been through 3 deployments and all the emotional issues that come with that. He now is a middle school teacher and we are blessed to never have to worry about being apart again. We have two children. We have a son who is ten and obsessed with video games, his first cell phone (it only has calling and texting) and basketball. He lives for traipsing around the neighborhood with his buddies. We also have a daughter who is seven-going-on-seventeen. She’s sassy and sweet. Her current faves are running around the neighborhood like one of the big kids, fashion (yes, already at seven) and playing with her friends. Now back to me… I am extremely social though I get my energy from my alone time. I am outspoken and loud, a recovered shy girl who cannot seem to get enough attention now that I’ve overcome that obstacle. Nevertheless, I go crazy if I don’t get some alone time everyday. As a morning person, this means I usually get up at 5am to get my me time. I’m loyal to a fault. I love with my whole heart and if you make it into my inner circle, I will do anything for you. My love language is quality time so I am the friend that rarely flakes out and who absolutely hates to be cancelled on. I typically only commit to things I want to do and cannot imagine cancelling. I am a mess and am so thankful for my relationship with Jesus which has truly transformed my life. I grew up with faith, but it didn’t become my number one until a year ago. It took having the rug pulled out from under me for me to truly commit my life to Jesus. While the processed sucked, I am so thankful because my faith now has deep roots. Lastly, I love social media and know that people who act like they are above it don’t really get it. I am thankful for the online community I have through Facebook, Instagram and Twitter. 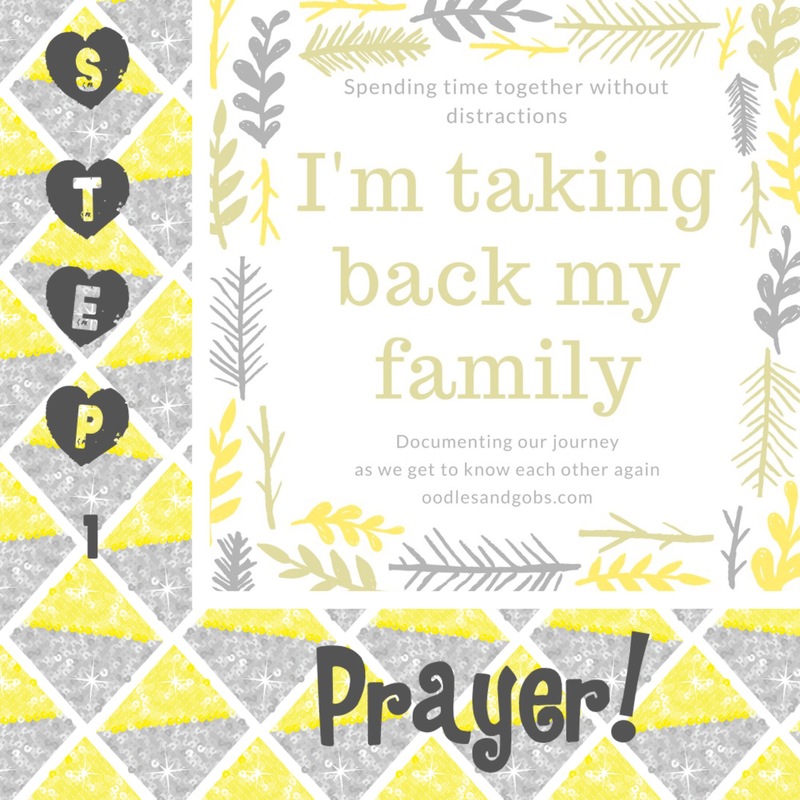 Taking back my family step 1: PRAYER! This may seem obvious to some, but it’s not obvious all the time to me (though it should be). When I want to make a change, I have to pray about it. So, I need do dust off my war room (AKA the master bath tub), write my goals down, paste them on the wall and pray my heart out every single day. That’s right, EVERY SINGLE DAY! The good, the bad and especially the ugly days. I need to pray for God to make us crave each other’s company, to look forward to dinner together, to want to play games and talk to other. God will do it. I don’t doubt it for a second. I need to pray for God to help us grow together through Him. I am being realistic in that I’m going to allow us to take baby steps at first. The other step for today is that we will eat dinner together with the TV off and all electronics away but more on that tomorrow… If we survive tonight! Pray for us! I would like to pick a word to describe 2015, but I’m not sure there is a word that is sufficient. If I’m 100% honest, it was bittersweet. There were many sweet moments and some bitter moments that lead to much growth for me in my faith and as a person. I don’t want to dwell on the bitter so here is a list of high moments from 2015. *Sitting on the patio on vacation watching One Tree Hill and Bachelor in Paradise as I drank my coffee while the rest of my family slept. *Tasting the different wines at Landon Winery with my book club gals. *Road tripping to Phoenix and becoming closer than I ever thought with some of the best people I’ve met. *Watching our book club grow. *Becoming closer to my son and finally feeling like I know him and get him. *Snuggling with my daughter who is full of sass and sweet all in one. *Attending a training with Leslie Zann that taught me more than network marketing skills. *Reading over 100 books and enjoying almost every second of that process. *Binge-watching too many shows on Netflix and Hulu. *Reconnecting with God and turning to Him through the bitter moments. *Getting on a plane again and facing my fears with God at my side. *Watching the kids play after school each day while I got to socialize with a dear friend. *Finding a new church home that took almost a year of invitations to visit to get me there. *Falling in love with Frogg Coffee in Allen–I miss those Friday meetups and highly recommend checking it out. *Journaling a lot and SOAKing a lot through the Bible. *Appreciating my time at home. *Celebrating 10 years of marriage through all the ups and downs that would have broken up many others because we love each other that much. *Hanging out with friends regularly and usually ending up talking about God and/or ghosts :). *Having a group of friends who keep me on track and focused on God no matter what life throws at us. *Getting over the road rage that ruined my mornings. *Allowing myself to choose family first. 2015 was filled with tears. Tears of joy, tears of pain. Here’s hoping that 2016 is filled with more joy than pain. I pray that we all are able to focus on joy and hope in 2016.